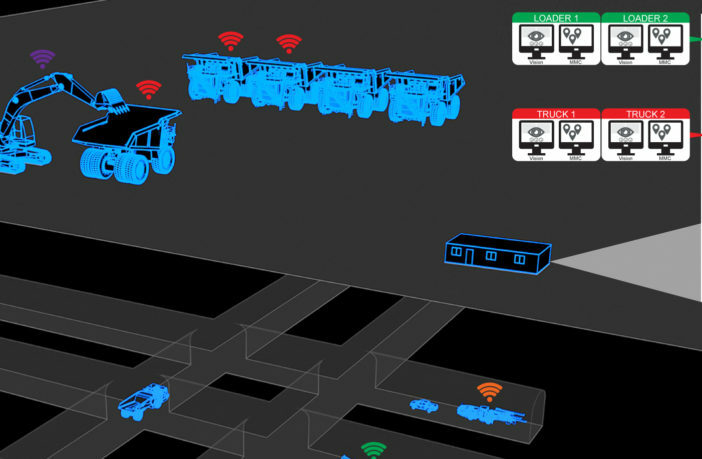 Remote Control Technologies (RCT) is increasing productivity and safety on mining sites with the introduction of its Multiple Machine Control (MMC) technology, the latest addition to its Control Master automation range, which enables a single operator to control more than one vehicle. The new operating system offers the opportunity of remote controlling more mining machinery from a single operator station in a central location on-site. It will transform the mining process, according to RCT’s automation and control product manager, Brendon Cullen. “For example, the operator can supervise digging, dumping and loading functions before sending the machine to its destination on auto tramming and taking control of the next machine,” Cullen said. A notable feature of MMC is that there is no need for mine sites to upload mine maps before utilizing the technology. In addition, while it operates on a digital network, a supporting system from RCT means it can interface with a mine site’s analog communications network. Cullen said, “The MMC solution can be operated locally at the work area, at a central location such as the office buildings on a mine site, or relocated to a central operating station location off-site to a city (near or far). “The system has the ability to change the way customers operate: some of the benefits associated with this change in mining practices include the possibility of introducing three eight-hour shifts from two 12-hour shifts. “This provides better work/life balance for operators and in the face of the labor shortages the industry is facing the job role can be opened up to more people who weren’t able to travel to site to work in the field due to family commitments or perhaps even a disability. MMC has already been deployed at several sites around the world and is helping to change the face of the mining industry.